Since the early days of New Orleans until the early 1950s of Hard Bop, trumpeters were the Gabriels of jazz. Just think of Louis Armstrong’s golden tone or the supernaturally fleet articulation of Dizzy Gillespie. 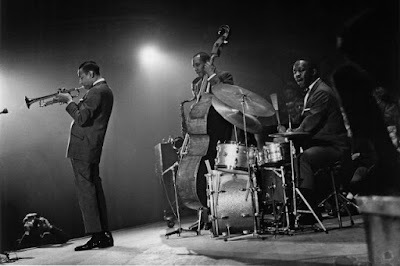 Lee Morgan was cut from a different cloth. You could hear plenty of grease and snarling attitude in his horn. His devilish sound also scored him some unprecedented crossover success. Yet, his tragically public demise will always define his all too brief life story. 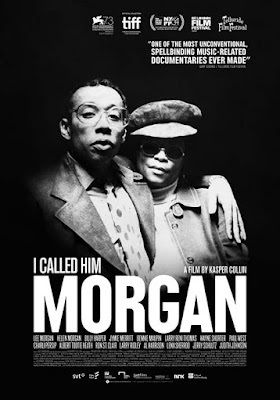 Swedish documentarian Kasper Collin revisits the music and the man through the memories of the woman who shot him and the rival who stoked her jealousy in I Called Him Morgan (trailer here), which screens during the 54th New York Film Festival. Evidently, Morgan’s common law wife Helen never cared for the name Lee. Hence the title. We hear this directly from the source herself in the spectral-sounding audio tapes of an interview Ms. Morgan granted jazz radio host Larry Reni Thomas mere weeks before her death. Offering no excuses and seeking no sympathy, she tells her story matter-of-factly, but her overwhelming feelings of regret are immediately evident. Collin (who also helmed the equally sensitive My Name is Albert Ayler) gives viewers the broad strokes of Morgan’s career, starting with his discovery in Dizzy Gillespie’s big band, his rise to prominence with Art Blakey’s Jazz Messengers, and his glory years as a vintage Blue Note Records recording artist. Along the way, label co-founders Albert Lion and Francis Wolff get their just due for producing the classic sessions that would largely define the Hard Bop style. However, the film is really centered around a forensic reconstruction of Lee and Helen Morgan’s imploding relationship. Initially, all his musician friends thought they were a good match, giving her credit for helping Morgan get clean and supporting him while he rebuilt his reputation. Yet, the film takes a heavy turn when she starts to describe how their romance turned to resentment. Like a Hard Bop Rashomon, Collin presents the events of that fateful night both from her perspective and that of Judith Johnson, the third side of Morgan’s love triangle (albeit a rather chaste one, according to her testimony). Shrewdly, Collin also incorporates quite a bit of Wolff’s celebrated session photography. In addition to many striking black-and-white images familiar to fans from classic Blue Note album covers, Collin includes some surprisingly light-hearted candid shots that should only further burnish Wolff’s photographic reputation. Collin scored sit-downs with a number of Morgan’s contemporaries, including Wayne Shorter, his legendary bandmate in the Messengers, as well as his own prominent sidemen, including Billy Harper, Jymie Merritt, Larry Ridley, and Bennie Maupin. However, the great Harold Mabern, a born raconteur if ever there was one, is conspicuously but perhaps not surprisingly absent. Reportedly, he still found it difficult to discuss Morgan’s death four decades after the fact, so presumably his feelings have not changed (which we should respect).